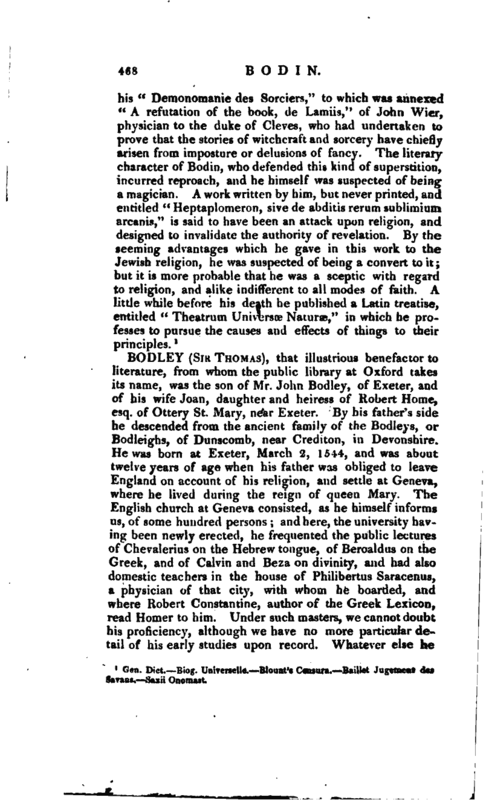 , that illustrious benefactor to literature, from whom the public library at Oxford takes its name, was the son of Mr. John Bodley, of Exeter, and of his wife Joan, daughter and heiress of Robert Home, esq. of Ottery St. Mary, near Exeter. By his father’s side he descended from the ancient family of the Bodleys, or Bodleighs, of Dunscomb, near Crediton, in Devonshire. He was born at Exeter, March 2, 1544, and was about twelve years of age when his father was obliged to leave England on account of his religion, and settle at Geneva, where he lived during the reign of queen Mary. The English church at Geneva consisted, as he himself informs us, of some hundred persons; and here, the university having been newly erected, he frequented the public lectures of Chevalerius on the Hebrew tongue, of Beroaldus on the Greek, and of Calvin and Beza on divinity, and had also domestic teachers in the house of Philibertus Saracenus, a physician of that city, with whom he boarded, and where Robert Constantine, author of the Greek Lexicon, read Homer to him. Under such masters, we cannot doubt his proficiency, although we have no more particular detail of his early studies upon record. Whatever else he | learned, he appears to have imbibed an uncommon love of books, to have studied their history, and to have prepared himself, although unconscious of the result, for that knowledge which, it is evident from his correspondence, he was perpetually increasing, and which at length, when the political prospects which once flattered his ambition were closed, enabled, as well as incited him, to re-found the public library at Oxford. After near five years residence in Holland, he obtained leave to return to England to look after his private affairs, but was shortly after remanded back to the Hague. About a year after he came into England again, to communicate some private discoveries to the queen and presently returned to the States for the execution of those councils he had secretly proposed. At length, having succeeded in all his negociations, he obtained his final recal in 1597. After his return, finding his advancement at court obstructed by the jealousies and intrigues of the great men, he retired from the court and all public business, and never could be prevailed with to return and accept of any | new employment. His own account of his treatment at this time is too amusing and characteristic to be omitted “I cannot chuse,” says he, “in making report of the principal accidents that have befallen unto me in the course of my life, but record among the rest, that from the very first day 1 had no man more to triend, among the lords of the council, than was the lord treasurer Burleigh for when occasion had been ottered of declaring his conceit, as touching my service, he would always tell the queen (which I received from herself, and some other ear-witnesses) that there was not any man in England so meet as myself to undergo the office of the secretary; and since, his son the present lord treasurer hath signified unto me in private conference, that, when his father first intended to advance him to that place, his purpose was withal to make me his colleague. But the case stood thus in my behalf: Before such time as I returned from the Provinces United, which was in the year 1597, and likewise after my return, the earl of Essex did use me so kindly, both by letters and messages, and other great tokens of his inward favour to me, that, alihough I had no meaning but to settle in my mind my chiefest dependance upon the lord Burleigh, as one that I reputed to be both the best able, and therewithal the most willing, to work my advancement with the queen; yet I know not how the earl, who sought by all devices to divert her love and liking both from the father and the son (but from the son in special), to withdraw my affection from the one and the other, and to win me altogether to depend upon himself, did so often take occasion to entertain the queen with some prodigal speephes of my sufficiency for a secretary, which were ever accompanied with words of disgrace against the present lord treasurer, as neither she herself (of whose favour before I was thoroughly assured) took any great pleasure to prefer me the sooner (for she hated his ambition, and would give little countenance to any of his followers); and both the lord Burleigh and his son waxed jealous of my courses, as if underhand 1 had been induced, by the cunning and kindness of the earl of Essex, to oppose myself against their dealings. And though in very truth they had no solid ground at all of the least alteration in my disposition towards either of them both (for I did greatly respect their persons and places, with a settled resolution to do them any service, as also in my heart I detested to be of any | faction whatsoever) yet the now lord treasurer, upon occasion of some talk that I have since had with him of the earl and his actions, hath freely confessed of his own accord to me, that his daily provocations were so bitter and sharp against him, and his comparisons so odious, when he put us in a balance, as he thought thereupon, he had very great reason to use his best means to put any man out of love of raising his fortune, whom the earl with sucn violence, to his extreme prejudice, had endeavoured to dignify. And this, as he affirmed, was all the motive -he had to set himself against me, in whatsoever might redound to the bettering of my state, or increasing my credit and countenance with the queen. When I” had thoroughly now bethought me, first in the earl, of the slender holdfast he had in the queen; of an endless opposition of the chiefest of our statesmen like still to wait upon him; of his perilous, feeble, and uncertain advice, as well in his own, as in all the causes of his friends; and when moreover for myself I had fully considered how very untowardly these two counsellors were affected unto me, (upon whom before in cogitation I had framed all the fabric of my future prosperity); how ill it did concur with my natural disposition, to become, or to be counted a stickler or partaker in any public faction how well I was able, by God’s good blessing, to live of myself, if I could be content with a competent livelihood; how short a time of farther life I was then to expect by the common course of nature when I had, I say, in this manner represented to my thoughts my particular estate, together with the earl’s, I resolved thereupon to possess my soul in peace all the residue of my days; to take my full farewell of state employments; to satisfy my mind with that mediocrity of worldly living that I had of mine own and so to retire me from the court, which was the epilogue and end of all my actions, and endeavours of any important note, till I came to the age of sixty three. Now although after this, by her majesty’s directions, I was often called to the court by the now lord treasurer, then secretary, and required by him, as also divers times since, by order from the king, to serve as an ambassador in France, to go a commissioner from his highness for concluding the truce between Spain and the Provinces, and to negotiate in other very honourable employments yet I would not be removed from my former final resolution insomuch as at length to reduce | me the sooner to return to the court, I had an offer made me by the present lord treasurer (for in process of time he saw, as he himself was pleased to tell me more than once, that all my dealing was upright, fair, and direct) that in case I myself were willing unto it, he would make me his associate in the secretary’s office And to the intent I might believe that he intended it bonafide, he would get me out of hand to be sworn of the council. And for the better enabling of my state to maintain such a dignity, whatsoever 1 would ask that might be fit for him to deal in, and for me to enjoy, he woul’d presently solic.t the king to give it passage. All which persuasions notwithstanding, albeit I was often assaulted by him, in regard of my years, and for that I felt myself subject to many indispositions, besides some other reasons, which I reserve unto myself, I have continued still at home my retired course of life, which is now methinks to me as the greatest preferment that the state can afford.“Mr. 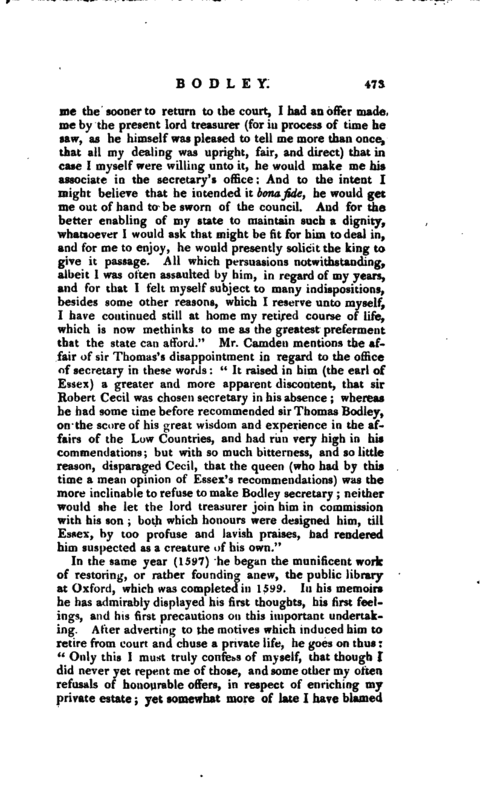 Camden mentions the affair of sir Thomas’s disappointment in regard to the office of secretary in these words” It raised in him (the earl of Essex) a greater and more apparent discontent, that sir Robert Cecil was chosen secretary in his absence whereas he had some time before recommended sir Thomas Bodley, on the score of his great wisdom and experience in the affairs of the Low Countries, and had run very high in his commendations; but with so much bitterness, and so little reason, disparaged Cecil, that the queen (who had by this time a mean opinion of Essex’s recommendations) was the more inclinable to refuse to make Bodley secretary; neither would she let the lord treasurer join him in commission with his son; both which honours were designed him, till Essex, by too profuse and lavish praises, had rendered him suspected as a creature of his own." In the same year (1597) he began the munificent work of restoring, or rather founding anew, the public library at Oxford, which was completed in 1599. In his memoirs he has admirably displayed his first thoughts, his first feelings, and his first precautions on this important undertaking. After adverting to the motives which induced him to retire from court and chuse a private life, he goes on thus “Only this I must truly confess of myself, that though I did never yet repent me of those, and some other my often refusals of honourable offers, in respect of emiching my private estate yet somewhat more of late I have blamed | myself and my nicety that way, for the love that I bear to my reverend mother the university of Oxon, and to the advancement of her good, by such kind of means, as I have since undertaken. For thus I fell to discourse and debate in my mind tiiat although I might find it fittest for me to keep out of the throng of court contentions, and address my thoughts and deeds to such ends altogether, as I myself could best affect yet withal I was to think, that my duty towards God, the expectation of the world, and my natural inclination, and very morality did require, that I should not wholly so hide those little abilities that 1 had, but that in some measure, in one kind or other, I should do the true part of a profitable member of the state. Whereupon examining exactly for the rest of my life what course I might take, and having sought (as I thought) all the ways to the wood, to select the most proper, I concluded at the last to set up my staff at the library door in Oxon, being thoroughly persuaded, that in my solitude and surcease from the commonwealth affairs, 1 could not busy myself to better purpose, than by reducing that place (which then in every part lay ruined and waste) to the public use of students. For the effecting whereof I found myself furnished, in a competent proportion, of such four kinds of aids, as, unless I had them all, there was no hope of good success. For without some kind of knowledge, as well in the learned and modern tongues, as in sundry other sorts of scholastical literature without some purse-ability to go through with the charge without great store of honourable friends, to further the design and without special good leisure to follow such a work, it could but have proved a vain attempt and inconsiderate. 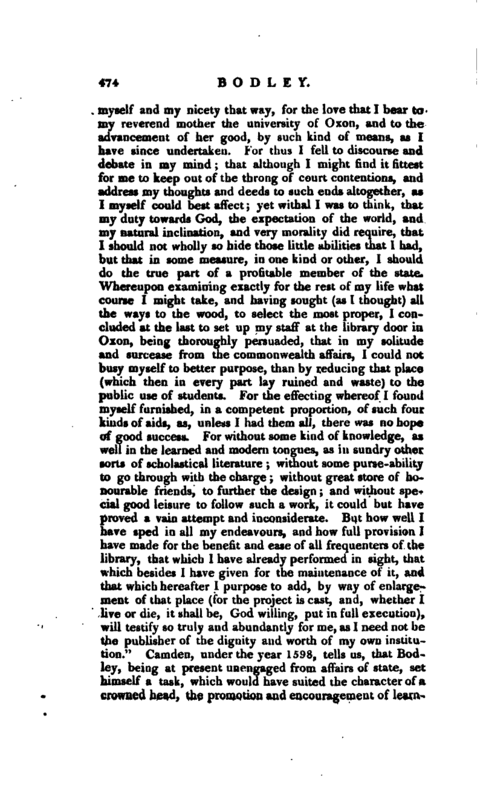 But how well I have sped in all my endeavours, and how full provision I have made for the benefit and ease of all frequenters of the library, that which I have already performed in sight, that which besides I have given for the maintenance of it, and that which hereafter I purpose to add, by way of enlargement of that place (for the project is cast, an. I, whether I live or die, it shall be, God willing, put in full execution), will testify so truly and abundantly for me, as I need not be the publisher of the dignity and worth of my own institution.” Camden, under the year 1598, tells us, that Bodley, being at present unengaged from affairs of state, set himself a task, which would have suited the character of a crowned head, the promotion and encouragement of | learning for he began to repair the public library at Oxford, and furnished it with new books. It was set up, he adds, by Humphrey duke of Gloucester, but through the iniquity of the times was, in the reign of Edward VI. stripped of all the books but he (Bodley) having made the choicest collection from all parts of the world of the most valuable books, partly at his own cost, and partly by contributions from others, he first stocked, and afterwards left it so well endowed at his death, that his memory deserves to bear a very lasting date amongst men of worth and letters.“The same author, in his” Britannia,“tells us, duke Humphrey’s library consisted of one hundred and twentynine volumes, procured from Italy at a great expence. His translator adds, that they were valued at above a thousand pounds, and that the duke in 1440 gave one hundred and twenty-six volumes more, and in 1443 a much greater number, besides considerable additions at his death three years after. But, before duke Humphrey’s time, Richard de Bury, alias Aungervil, bishop of Durham, in 1295, gave a great number of books to the university, which were kept in a place for that purpose in the college, now Trinity college, which the monks of Durham had founded in the north suburbs of Oxford; an account whereof may be gathered from a book written by himself, called” Philobiblos, sive de amore librorum, et institutione Bibliothecae.“And after him, in 1320, Thomas Cobham, bishop of Worcester, built another over the old Congregation-house in the north coemetery of St. Mary’s. 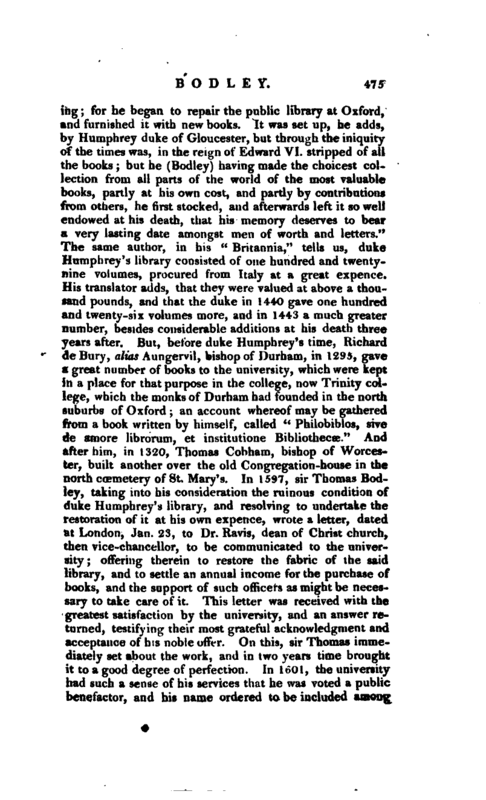 In 1597, sir Thomas Bodley, taking into his consideration the ruinous condition of duke Humphrey’s library, and resolving to undertake the restoration of it at his own expence, wrote a letter, dated at London, Jan. 23, to Dr. Ravis, dean of Christ church, then vice-chancellor, to be communicated to the university; offering therein to restore the fabric of the said library, and to settle an annual income for the purchase of books, and the support of such officers as might be necessary to take care of it. This letter was received with the greatest satisfaction by the university, and an answer returned, testifying their most grateful acknowledgment and acceptance of his noble offer. On this, sir Thomas immediately set about the work, and in two years time brought it to a good degree of perfection. In 1601, the university had such a sense of his services that he was voted a public benefactor, and his name ordered to be included among | the other benefactors repeated in the public prayers. He furnished it with a large collection of books, purchased in foreign countries at a great expence and thi.-, collection in a short time became so greatly enlarged by the generous benefactions of several noblemen, bishops, and others, that neither the shelves nor the room could contain them. &ir Thomas then offering to make a considerable addition to the building, the motion was readily embraced, and, on July 19, 1610, the first stone of the new foundation was laid with great solemnity, the vice-chancellor, Doctors, masters of arts, &c. attending in their proper habits, a speech being made upon the occasion. But sir Thomas Bodley did not live to see this part of his design completed, though he left sufficient means in trust, as he bestowed his. whole estate (his debts, legacies, and funeral charges defrayed) to the noble purposes of this foundation. 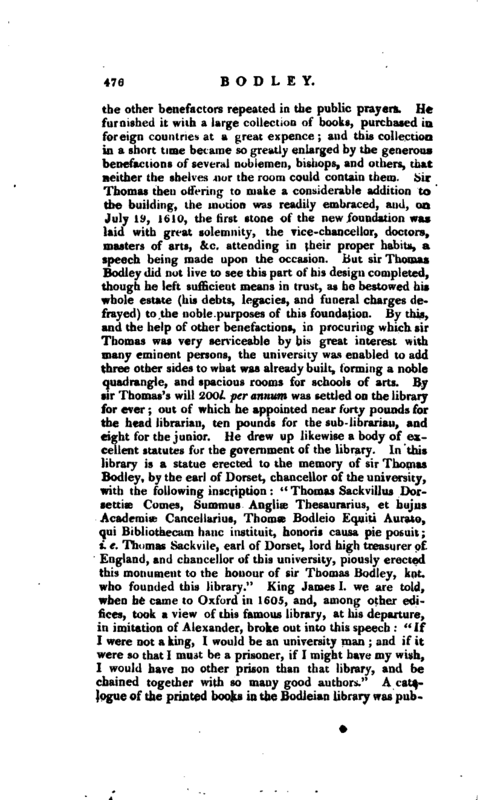 By this, and the help of other benefactions, in procuring which sir Thomas was very serviceable by his great interest with many eminent persons, the university was enabled to add three other sides to what was already built, forming a noble quadrangle, and spacious rooms for schools of arts. By sir Thomas’s’ will 200l. per annum was settled on the library for ever out of whichhe appointed near forty pounds for the head librarian, ten pounds for the sub-librarian, and eight for the junior. He drew up likewise a body of excellent statutes for the government of the library. In this library is a statue erected to the memory of sir Thomas Bodley, by the earl of Dorset, chancellor of the university, with the following inscription:” Thomas Sackvillus Dorsettia? Comes, Summus Angliae Thesaurarius, et hujus Academise Cancellarius, Thomse Bodleio Equiti Aurato, qui Bibliothecam hanc instituit, honoris causa pie posuit i. e. Thi.mas Sackvile, earl of Dorset, lord high treasurer of England, and chancellor of this university, piously erected this monument to the honour of sir Thomas Bodley, knt. who founded this library.“King James I. we are told, when he came to Oxford in 1605, and, among other edifices, took a view of this famous library, at his departure, in imitation of Alexander, broke out into this speech” If I were not a king, I would be an university man and if it were so that I must be a prisoner, if I might have my wish, 1 would have no other prison than that library, and be chained together with so many good authors." 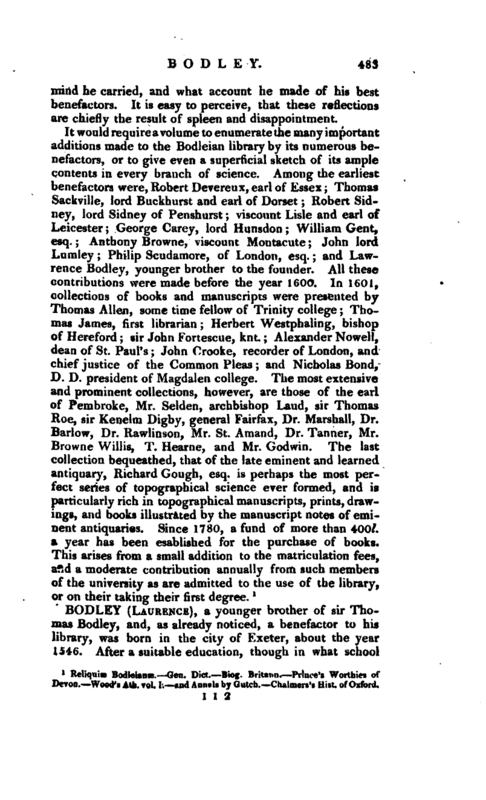 A catalogue of the printed books in the Bodleian library was | published in 1674 by Dr. Thomas Hyde, then chief librarian another of the manuscripts was printed in 1697; and a more ample catalogue of the books was printed at Oxford, in 1738, in two volumes, folio. These two funeral orations are printed in “Batesii Vitae,” p. 416, and that of Hales in his works. 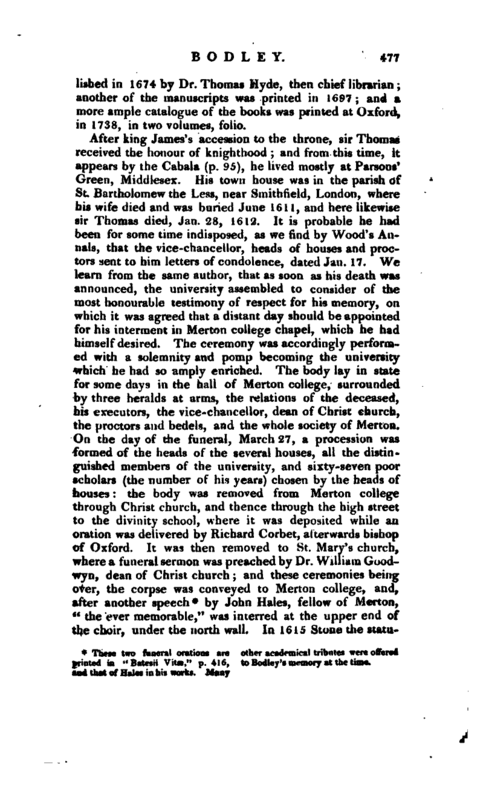 Many other academical tributes were offered to Bodley’s memory at the time. by John Hales, fellow of Merton, “the ever memorable,” was interred at the upper end of the choir, under the north wall. In 1615 Stone the | statuary was employed to erect a monument of black and white marble, on which is placed his effigies, in a scholar’s gown, surrounded with books and at the four corners stand grammar, rhetoric, music, and arithmetic. On each hand of his effigies stands an angel that on the left holds out to him a crown and that on the right a book open, in which are these words Non delebo nomen ejus de libro vitae I. e. “I will not blot his name out of the book of life.” Underneath is the figure of a woman, sitting before the stairs of the old library, holding in one hand a key, and in the other a book, wherein the greatest part of the alphabet appears; and behind are seen three small books shut, inscribed with the names of Priscianus, Diomedes, and Donatus. Beneath all are engraven these words Memoriae Thomae Bodley Militis, Publicae Bibliothecae fundatoris, sacrum. Obiit 28 Jan. 1612.
be a graduate, and take the same oath as the keeper did at his admission. He is allowed likewise an assistant in his office, and an inferior attendant (usually some poor scholar) to keep the library clean. 6. The revenue settled for the maintenance of the library, &o. to be lodged in the university chest, and managed by the vicechancellor and proctors for the time being. 7. None to enjoy the freedom of study there, but only doctors and licentiates of the three faculties, bachelors of divinity, masters of arts, bachelors of physic and law, and bachelors of arts of two years standing; also lords and the sons of members of parliament, and those who become benefactors to the library and all such, before admission to such priviledge, to take an oath, prescribed in the Statutes. 7. Any graduate, or other person, who shall be convicted of dismembering, or purloining, or altering any word or passage of any book or books, to be publicly degraded, and expelled the university, 8. 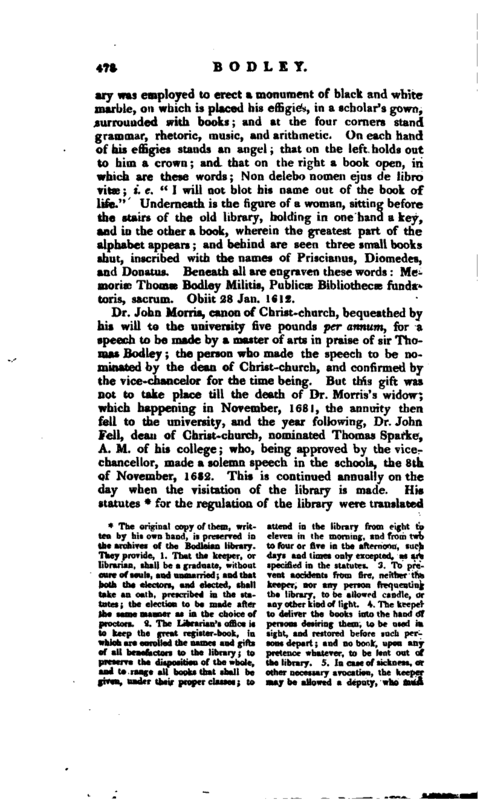 Eight overseers or visitors of the library are appointed, viz. the vicechancellor and proctors, the three professors of divinity, law, and physic, and the two regius professors of Hebrew and Greek, who are to inspect the state both of the building and the books, the behaviour of the keeper, &c. annually on the 8th of November; and, on the visitation-day, forty shillings is allowed to be expended on a dinner or supper for the visitors, and gloves to be presented them by a beadle, viz. seven pair, of ten shillings the pair, to the five professors and two proctors, and one pair, of twenty shillings price, to the vice-chancellor, besides forty shillings in money to each of the proctors, and twenty nobles to the vice-chancellor, &c.
for the regulation of the library were translated | out of English into Latin by Dr. John Budden, principal of Broadgate-hall (now Pembroke college), and incorporated with the university statutes. Sir Thomas wrote his own life to the year 1609, which, together with the first draught of his statutes, and a collection of his letters, were published from the originals in the Bodleian library, by Hearne, under the title of “Reliquiae Bodleianse, or, some genuine remains of sir Thomas Bodley,” London, 1703, 8vo. Of this we have availed ourselves in the preceding account, to which something must now be added from subsequent information. 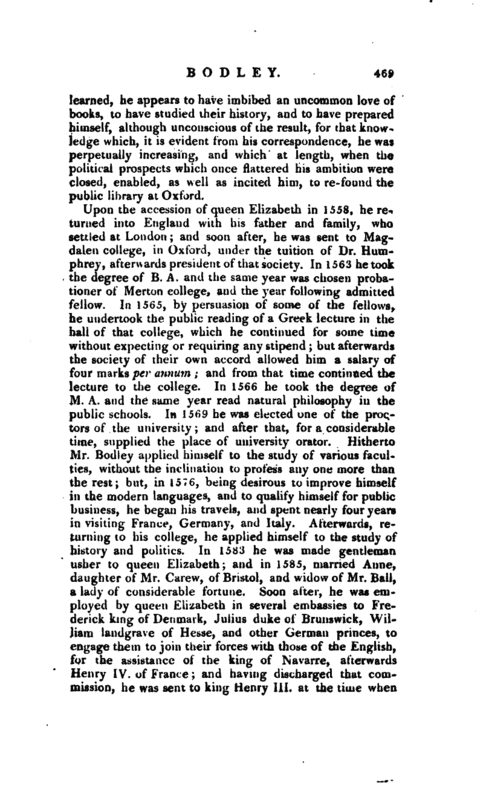 It is not easy to quit the history of a man to whom literature is so exceedingly indebted, and who cannot be contemplated without veneration, not only by the sons of Oxford, but by every one who has profited by access to the invaluable library which will hand his ‘name down to the latest posterity. 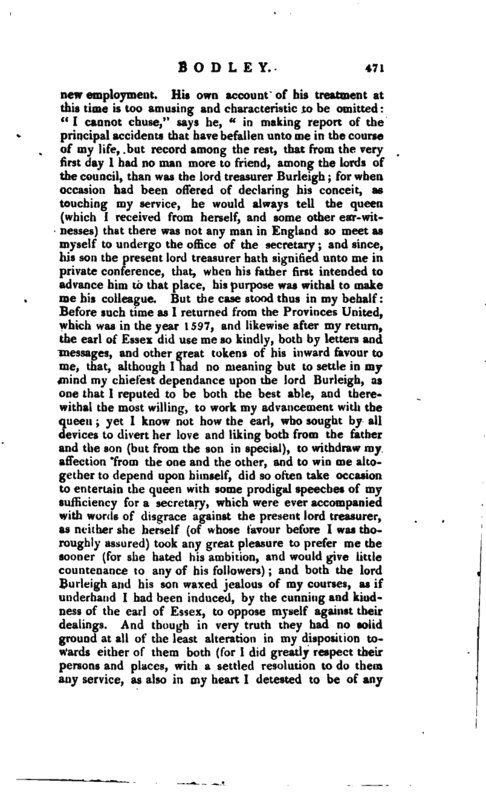 In Dr. Birch’s Memoirs of the reign of queen Elizabeth, there are extracts of several letters written by sir Thomas Bodley to the earl of Essex, the lord treasurer Burghley, sir Robert Cecil, and Mr. Anthony Bacon, chiefly during sir Thomas’s residence in Holland. From these, therefore, and from other passages in that work, we shall select a few particulars, which may serve to render the account of his life somewhat more complete. In 1583, when Mr. Stafford (afterwards sir Edward Stafford) was appointed ambassador to France, it was said that Mr. Bodley was to | go with him as chief secretary but no evidence appears of his having actually served the ambassador in that capacity. 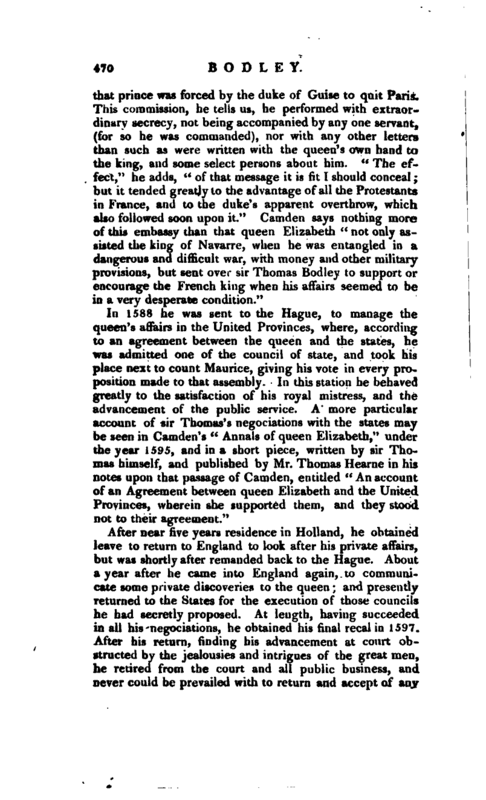 The letters we have mentioned exhibit a farther proof of the fidelity and diligence with which he discharged his duty, in the management of queen Elizabeth’s affairs in the United Provinces. As some of the facts the letters relate to r are too minute to require a particular discussion in this place, it may be sufficient to refer generally to Dr. Birch’s Memoirs. 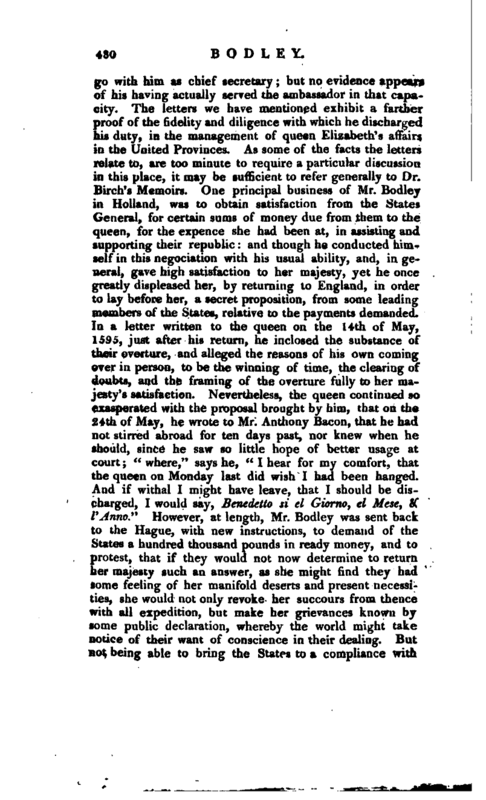 One principal business of Mr. Bodley in Holland, was to obtain satisfaction from the States General, for certain sums of money due from them to the queen, for the expence she had been at, in assisting and supporting their republic and though he conducted himself in this negociation with his usual ability, and, in general, gave high satisfaction to her majesty, yet he once greatly displeased her, by returning to England, in order to lay before her, a secret proposition, from some leading members of the States, relative to the payments demanded. 4 In a letter written to the queen on the 14th of May, 1595, just after his return, he inclosed the substance of their overture, and alleged the reasons of his own coming over in person, to be the winning of time, the clearing of doubts, and the framing of the overture fully to her majesty’s satisfaction. Nevertheless, the queen continued so exasperated with the proposal brought by him, that on the 24th of May, he wrote to Mr. Anthony Bacon, that he had not stirred abroad for ten days past, nor knew when he should, since he saw so little hope of better usage at court “where,” says he, “I hear for my comfort, that the queen on Monday last did wish I had been hanged.” And if withal I might have leave, that I should be discharged, I would say, Benedetto si el Giorno, el Mese, & ’lAnno." However, at length, Mr. Bodley was sent back to the Hague, with new instructions, to demand of the States a. hundred thousand pounds in ready money, and to protest, that if they would not now determine to return her majesty such an answer, as she might find they had some feeling of her manifold deserts and present necessities, she would not only revoke her succours from thence with all expedition, but make her grievances known by some public declaration, whereby the world mi^ht take notice of their want of conscience in their dealing. But not being able to bring the States to a compliance with | the terms insisted upon, he was, at last, commanded to effect the very same project, which he had before carried to England, and for which he had endured so much bitterness and grief; and in conclusion he brought them to these terms: that they would consent to a discharge of the auxiliary entertainments, which would ease her majesty of at least forty thousand pounds a year, upon condition that her intention might be known two months before to make an annual presentation of twenty thousand pounds, to be paid every time by public legation on her majesty’s birth-day; but not to be continued beyond her reign: to assist her majesty, if there should be occasion, with their shipping and other sea provisions, and to come to no accord or pacification with the Spaniard, unless with her consent; and to discharge the sum of four hundred thousand pounds in four years, but payable only to her majesty’s person. 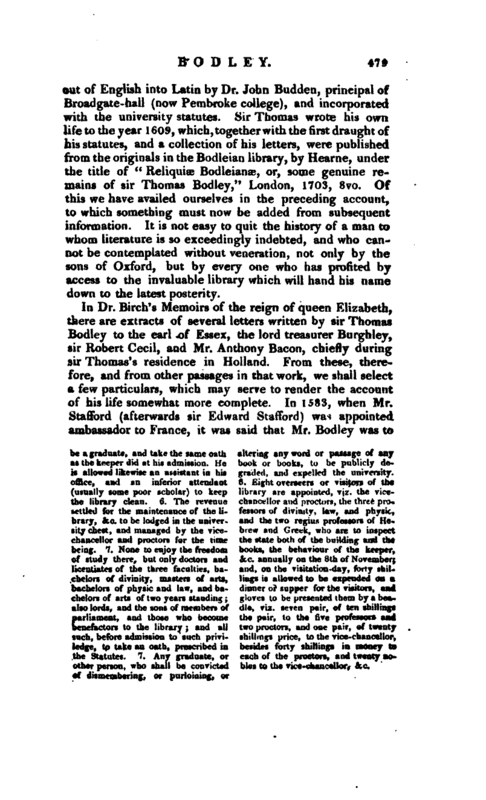 It has, if we mistake not, been imagined, that the former part of this last letter contains a reflection on sir Thomas Bodley, as if he could scarcely be trusted, where curious books were in sight but it is fully evident, from the latter part of it, that no such thing was intended, and that sir Henry Savile was only in jest. Though sir Thomas Bodley’s design, in re-founding the public library at Oxford, was so excellent and useful, and his bequeathing his estate for that purpose so commendable, some persons were dissatisfied at their not being remembered by him in his last will. 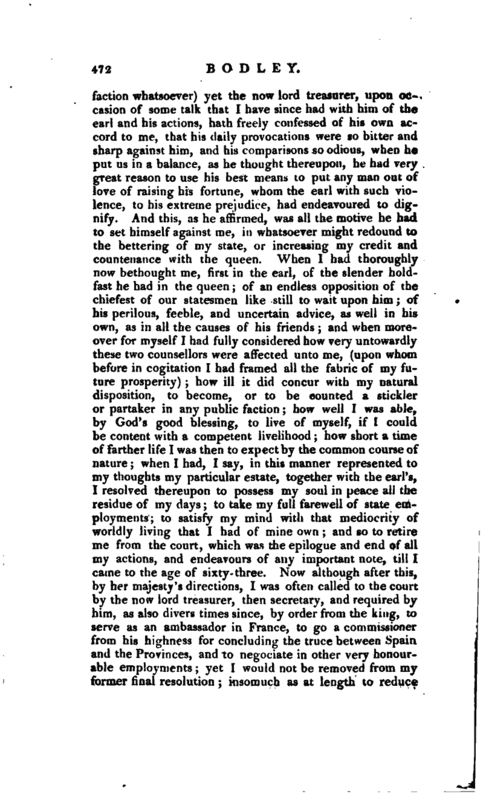 This, at least, was the case with Mr. Chamberlayne, who, though not a relation of sir Thomas’s, yet having had a long acquaintance with him, complains of his conduct with no small degree of malignity. 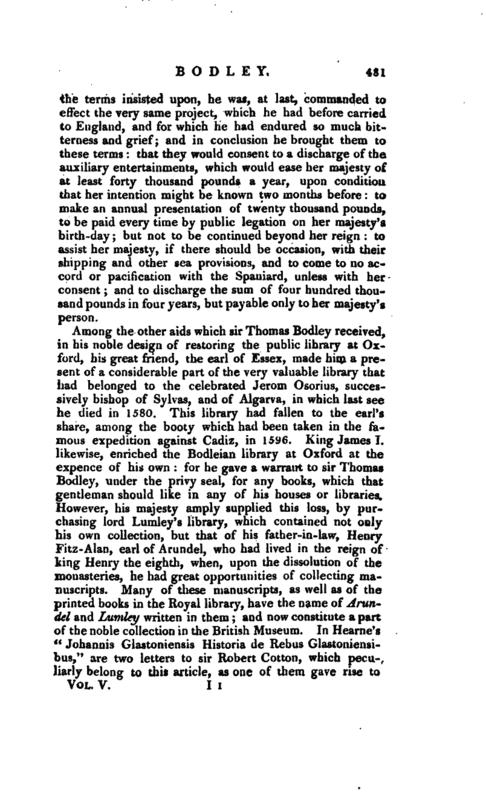 He says that sir Thomas Bodley was so carried away with the vanity and vain glory of his library, that he forgot all other respects and duties almost of conscience, friendship, or good nature. 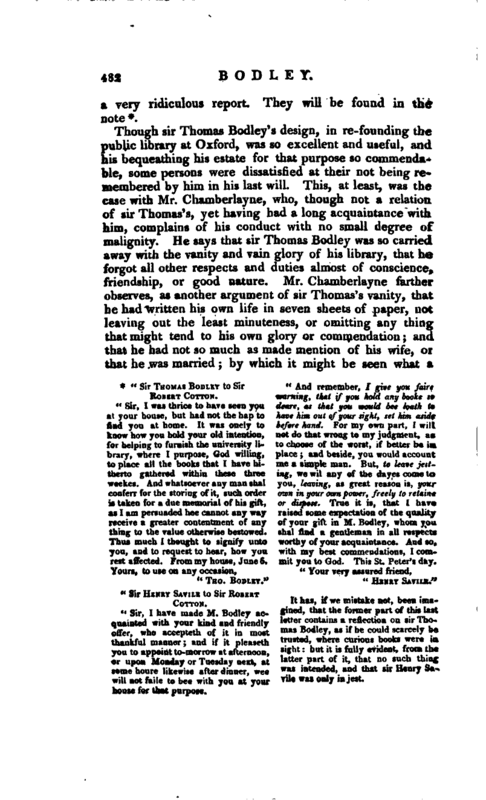 Mr. Chamberlayne farther observes, as another argument of sir Thomas’s vanity, that he had written his own life in seven sheets of paper, not leaving out the least minuteness, or omitting any thing that might tend to his own glory or commendation and that he had not so much as made mention of his wife, or that he was married by which it might be seen what a | mind he carried, and what account he made of his best benefactors. It is easy to perceive, that these reflections are chiefly the result of spleen and disappointment.